I took a day trip to a couple of cities up the river from Vienna called Melk and Krems. Or as I refer to them, Milk and Cream. The plan was to take a train to Melk, then a boat down to Krems, then the train back to Vienna. 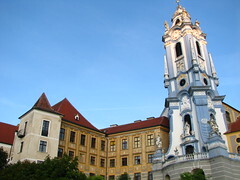 Melk has a unique monastery and Krems has a few smaller attractions. At 45 Euro for the kombi ticket (train, boat, admission), it was quite economical. When I got off the train in Melk, I smelled sweetness in the air. There was an apple tree nearby and many of the fruits had fallen to the ground and were ripening. There were many colorful trees and flowers. The air was cool. It was a nice day for a trip like this. I walked to the main square area and it reminded me of the trip I took to the town of Blarney. The abbey was originally a palace and was given to the Benedictines later. Its original purpose is obvious, as the grandeur of the place does not befit monks. There are about 500 rooms, one or two 200 meter long hallways, marble and gold everywhere. It all made me wonder how you’d fill that space. I got a single ticket rather than going with a group. However, the place was a bit tight so I was often stuck behind tour groups. Because of that I learned a lot. Though one of the groups spoke Spanish, they were mostly English speaking. One thing I noted was that I was the youngest person in the place, aside from the tour guides and the grandkids. The first few rooms were meant to be symbolic and were bathed with differently colored lights. Blue, green and red. The blue is meant to symbolize innocence. I think. All the symbology was lost on me – and I was with an English group at that point. The library has thousands of books. Much of them dedicated to the apparently rich astronomical history of the monastery. I was with a Spanish group at this point so didn’t understand much of what was being said. And there were too many people in the room to walk around and see the small placards. The tour concluded at the church. Again, gold and marble. Next stop, head to the boat to go down river to Krems. We made our way slowly down the river, past some spectacular views. A humble village that looks like I imagine it would have 200 years ago. A high cliff where the local regents made their enemies jump to their deaths. A quaint little summer palace for some king or other. We had to change boats in Spitz and so disembarked onto the small stretch of ground that was backed against several restaurants and a church. A wedding had just finished up so all the guests and the wedding party were milling about as well. It was pretty crowded. The reception was apparently to be held on the boat to Krems. That boat had an area which seemed to be built for hosting such events, so it didn’t overwhelm the craft. Another port of call on our three-hour tour was Dürnberg. It has a splendidly painted church and its port looks really nice, as you can see in the photo to the right. From the looks of the landings at Spitz and Dürnberg, these two cities might have been nice to see as well. Maybe make it a couple of days rather than just one. Krems was rather unspectacular as we reached it near dark. I didn’t make time to see anything but instead just headed for the rail station to go back to Vienna. Here’s a lesson, instead of waiting around in Melk for the 16:15 boat to Krems, make sure you take the 13:50 boat. The boat will invariably be late and even if not you’ll be hard pressed to get to the last express train before it leaves. And the next slow train doesn’t leave for a couple of hours and takes 2 hours, rather than one. Unless it’s also late. I got back into Vienna around 10:30 fairly tired. But it was a good trip, overal. Posted on September 30, 2009, in Europe, Mystery Trip and tagged austria, durnberg, Europe, krems, melk, Mystery Trip, random plan, travel, vienna. Bookmark the permalink. Leave a comment.